Update: Spanish Prime Minister Rajoy refuses to resign ahead of tomorrow's 'done deal' vote of no confidence in his administration (given that the opposition apparently has the votes) and Maria Cospedal has confirmed that centre-left Socialist party leader Pedro Sanchez is set to become the new Spanish prime minister. Mariano Rajoy became prime minister of Spain on December 20, 2011 and barring some miracle, his political career will end on June 1, 2018, because moments ago it appears that the required number of votes to ouster the premier in tomorrow's vote of no-confidence was reached. As we reported earlier, Socialist leader Pedro Sanchez who is spearheading the vote against the unpopular premier, already had the backing of the anti-establishment group Podemos, and Catalan separatists Esquerra Republicana and PdeCat. He only needed the support of Basque Nationalists to clinch it. Moments ago the Basques officially sided with Sanchez, when the Basque Nationalists informed both Rajoy’s People’s Party and the Socialists that they’ve decided to vote against the prime minister, according to state broadcaster Television Espanola. With the Catalans of PdeCat also expected to support Sanchez, that would be enough to defeat Rajoy, as there are now 177 votes against Rajoy with 176 needed. Being the decisive vote against Rajoy must be a welcome revenge for the various Basque and Catalan separatist groups following the unprecedented crackdown that Rajoy unleashed against the various parties last fall when in the aftermath of the Catalan referendum, Spain cracked down on all separatists in the region. The socialists governing with a minority and the current parliamentary line-up would be very unstable and struggle to get anything done, adding to uncertainty. 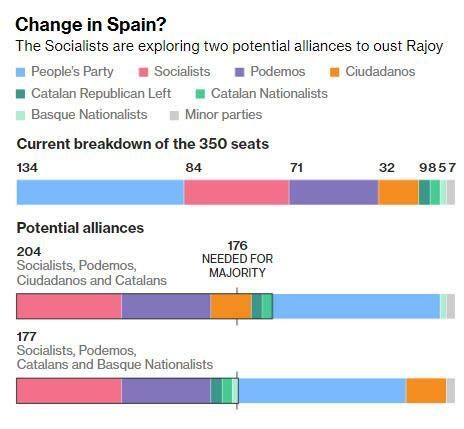 They may also take a conciliatory approach to the Catalans, raising the prospect of releasing separatists from jail and putting the issue of independence in Catalonia back on the agenda -- that's the biggest risk scenario, as our local expert Ben Sills puts it. The Socialists also want to tax the banks more heavily, another market negative. In other words, while Italy remains the top risk for euro-area markets, "and the longer-term view with Ciudadanos gaining traction may still be more favorable, it may pay to be alert to the Spanish risks."